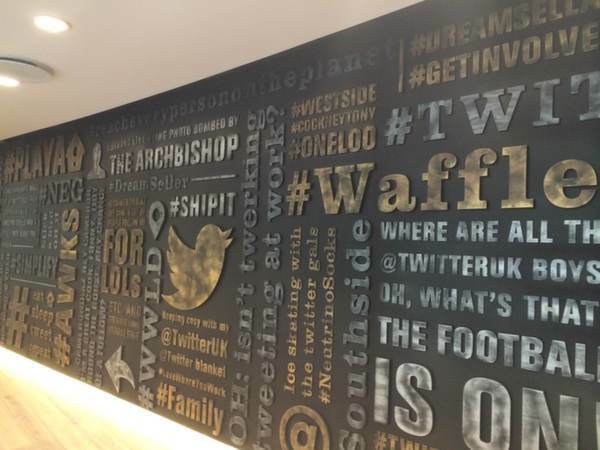 The other day I visited Twitter’s London head office for the first time. I felt quite curious to see what it was like. I’ve visited hundreds of businesses and organisations and often you don’t need very long to understand what’s the company culture is like. Company culture, you know the fluffy, abstract thing that is hard to grab, but easy to see inside your mind and says a lot about the organisation you visit. I walked out from the tube at Piccadilly Circus, passed the Whole Foods shop and entered the building, it looked as a typical clean and structured office building. The receptionist kindly showed me where to take the lift, it was one of these lifts where you press the floor you are going to outside the lift – not so human friendly. Of course I got in the wrong lift and went up to the seventh level. Walked out of the lift and pressed level one. When I exit the lift I see a small happy Twitter bird showing the way to the reception. I walked through one of these big open indoor spaces. I could see all the way up to the glass ceiling, four pieces of modern art welcomed me while I crossed the open area. ‘Welcome, can you please fill in your details here’. The next second I see my friend who’s been standing just behind me ‘Hello and welcome to our office’, he said. We are standing next to a wall full of words, hashtagged expressions and random sentences, it looks as each word and each letter have been carefully moulded by a sculptor. How fascinating I though to myself, you move into a new office and there is a trace of your thoughts you have shared online on the wall next to the reception. We walk over to the other side of the reception and there is even more words and hashtags. One was #TooManyToms, several people named Tom work in the office and someone expressed their frustration with this hashtag. We turn left and we walk into a big room, they are preparation an event. On the wall I see more art. One of the pieces draw my attention, it’s a heart made of names. 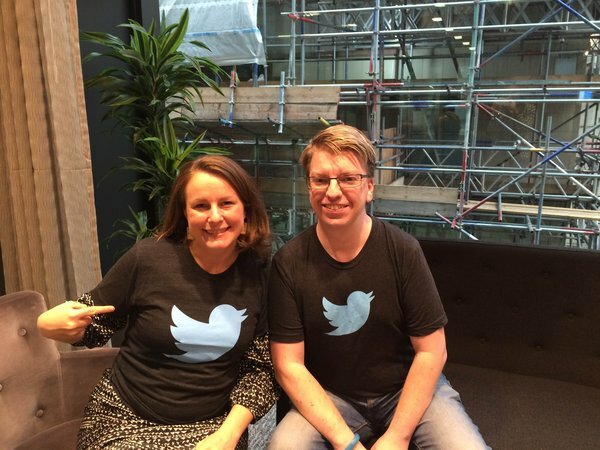 Then we sat down for a coffee and chat, and I even got a branded Twitter T-shirt so I felt part of the crowd. When I left I couldn’t stop thinking about the symbolic leadership in the art and the values it’s communicating. In my short meeting I could see how they expressed their mission in the art in the reception. Getting a mixture of their employees’ thoughts and online randomness on the wall and design an art installation is very smart. Twitter appreciate their staffs’ stories, creativity, ideas and thoughts, that they shared online. People’s tweets converted into a beautiful memory. 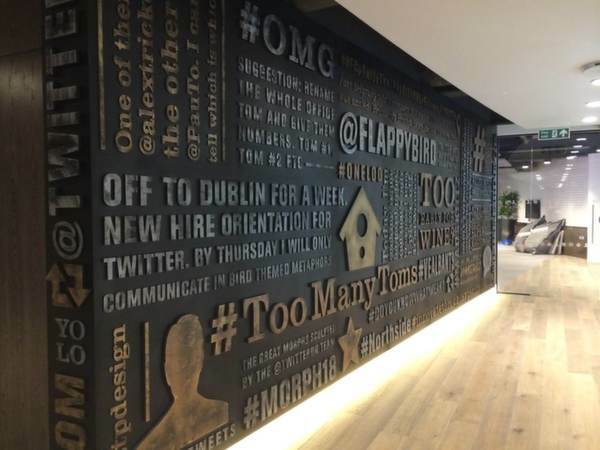 The leaders in the Twitter office must know something unique about how to connect and how to make people feel part of something bigger. The office breathed appreciation, connectivity and collaboration in between the walls. Disclosure: I’m not working for Twitter and the reason I wrote this post is that I am very interested in art and leadership. This is my personal interpretation of the art I saw in the entrance. Here is an excerpt from my book Digital Leadership. Creativity is a mystery, as is love. If you’re managing creative people and you want the best out of them, you need to let go of many preconceptions about how people ‘are’. New innovations and creative ideas will come alive if you are creating an environment that is helping people to show off their creativity. You have to create space for the creativity mystery to exist and let go of many of your own insecurities that you might feel inside you. These insecurities might stop yourself and the people you work with to perform your best as a team. I would recommend you read the book Creativity: Flow and the Psychology of Discovery and Invention by Mihaly Csikszentmihalyi [HarperCollins 1996]. He makes some good points in it about creativity, creative people and flow. It is his research about flow that made him know to me many years ago. Creative people have a lot of physical energy and they do take time to rewind and relax. Their energy level can be totally different from day to day. Creative individuals tend to be smart but at the same time naïve. Creative people are both playful and disciplined at the same time. Creative people are full of imagination and they have a gut feeling for what’s around the corner. Being able to use your fantasy and imagination whilst being rooted in reality is a trait of creative individuals. When a person who is fully using their creative abilities is developing an idea, they tend to be introverted for a period of time. Then when the new creative idea is developed, they want to go out and meet other people and share the idea with them. Creative people are both introverted and extroverted. His research shows that it’s important for us to not judge people too quickly; you never know if you are working with a creative genius. All people have some sort of talent and if you want them to share these with you, you need to treat people well and accept them as they are. I believe one of the most dangerous things you can do in any human relationship is to place someone in a box: you are like that; you always do this; typical you... When you are putting people in a box, it’s not good for their creativity or flow, and neither is it good for yours. Love, people and relationships are all big mysteries. Treat them nicely and you’ll get much more in return. Some of the most creative companies in the world were created by geeks. Remember Apple, Pixar and the like. IT and digital teams are very dependent on experts — geeks, programmers and developers who’ll create magic solutions for your website and digital tools. To keep them happy, it’s even more important for you to know about the creative process and how to handle ideas. I’ve worked with a lot of different people and some of them have been a bit geekier than others and often they were very proud to be geeks. I don’t think it’s a big difference between managing geeks and other staff members, but you should be aware that those geeks who don’t think your web environment is interesting enough are likely to move on pretty swiftly. You always want your team members to perform their best, to come up with great solutions to all your problems. If the geeks don’t like you, they will not come up with the best solution. And you’ll not provide your customers with the best solution. If the geeks find you annoying as a leader, they are more likely than any other employees to leave your organisation. Very geeky people can be introvert, and you might not have super social conversations with them. The reality is that some people are more introvert and some people talk too much. That’s life. You as a leader have to adopt your style and be nice to everyone in your team. That will help you, and people will step forward to work with you. Training is always a valuable tool if you wish to keep your geeky team members happy. Most people love to learn new stuff, especially knowledge hungry geeks. Give them free programming books on Amazon. Let them use and improve their skills as much as possible. I’m a bit geeky myself and I was once hired to work in the web department but ended up doing mostly administration. I moved on and got a new job. Smart people want to work with other smart people and be in a team that gets on socially. Make sure that good communication processes are set up and that the entire team knows how and where communication can be shared. Remote working will also help keep your team members happy. One great way to give compliments to your team is to make your team members shine in front of others. They will love you for that, even if they don’t say it out loud. The simple truth is that we all want to work with people who make us feel great and valuable — geeky or not. But in the world of digital you have to work well with geeks because they have mind power over the magic solutions that will help you make money in the future. To keep a creative environment alive you need to avoid the HIPO syndrome as much as possible. This stands for Highest Income Person’s Opinion or the person with most power. If you make technical decisions based on advice from a non-techie then the developers won’t do a good job. A huge global company chose to go with an old enterprise resource planning (ERP) solution five years ago. They made big investments and started the implementation. One year into the project it turned out that Oracle stopped upgrading and supporting the solution they had bought. They lost several technical people and a lot of enthusiasm in the project. Nobody wanted to work with a technical system that had very little support and development in the future. Why do you think they were finding themselves in this situation? The management didn’t listen to the advice they got from the technical developers. If they had done that, they would have invested in another ERP product. To listen to feedback and an ability to learn are musts for creative leaders. I’ve been to many networking events and I’ve even written a business thesis on the subject of networking and professional development. Look at your network, all the people you know. Who has had most impact in your life? Who has helped you to move forward? Who has opened new doors for you? Is it the world’s famous heroes who have been influencing you? Is it the amazing people winning awards and prizes for their talents, such as the Oscar and Noble Peace Prize winners? No, it is not the famous heroes who make the biggest mark in our lives. It’s our family, teachers and friends who are shaping us. Your identity is shaped by the people you meet and what happens to you. We’re our stories, and they are shaping us and how we see the world around us, how we think, how we move forward and how we deal with our challenges. I’ve had a handful of people who have influenced me a lot. And I’ll always be grateful for having them in my life; you’re the best teachers I possibly could have had. Be grateful for the people you have met. Be grateful for what you’ve learnt. Be grateful for all great teachers you’ve had so far. And keep your door open to let new people into your life. from Gothenburg to Stockholm, Sweden. In the last year I’ve been to a few exhibitions and at all of them New York Times (NYT) has tried to sell me their online subscription. You know the kind of deal when the first three months are almost free and then you pay full price. For me it feels a bit weird that they are trying so hard. But now I think I understand why. They have problems and they have problems engaging their audience. NYT is an amazing brand, they have almost 15 million articles in their archive and they have fab journalists. But they are struggling with their ability use the gift of digital technology to reach their readers. In the report they point out hundreds of problems. One huge one is that the leaders who are at the helm have no clue about digital stuff. How are they then going to make good digital decisions and hire the right kind of people? Their different business units have huge collaboration problems and I even read that the Facebook and Twitter accounts are managed by different teams. Smart ha?! Being great at digital innovation is about getting the basics right. In the report you can read that they have never had a good tagging strategy for their content. So if anyone would like to search for similar articles they need to use Google. The World Wide Web is packed with content and webpages, we need to tag and use good categories to make it easier to navigate. Did’t the leadership at NYT know about this? Some of the journalists are great at connecting online using tools such as Twitter, but some of them are not. Shouldn’t every reporter have to use Twitter etc? One of the biggest problems with digital innovation is that it takes time. In the report you can read that this is something that they staff are missing. To come up with great, replicable digital ideas you need time, structure and freedom. 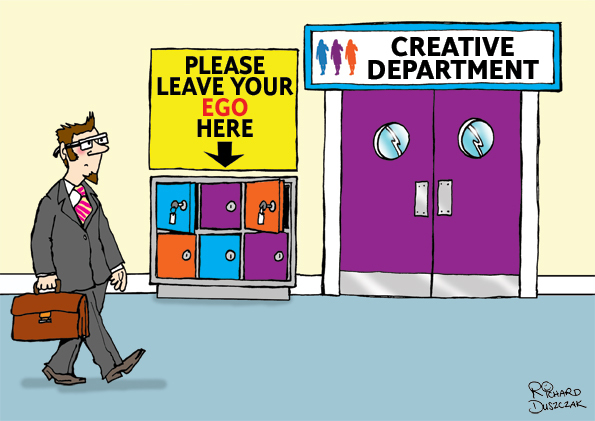 If you are stuck in administration and other full on activities you are not going to be great at innovation. You are most likely going to stay in your old pattern and not reach much higher. If they would like some inspiration I would like to send them a copy of my book Digital Leadership. 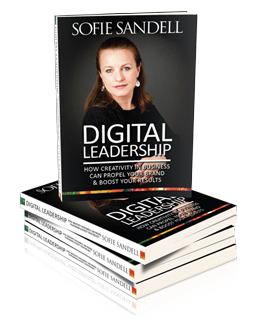 Sofie Sandell is a professional speaker and the author of the book Digital Leadership – you can download a free PDF on here or buy a hard copy or Kindle on Amazon. Typical learning methods are classroom studies, seminars, e-learning and videos. But actual learning something is a work that starts when we reflect about something. Often it’s the informal meetings and not planned activities that makes a difference. When I was website manager for JCI UK I had lunch with three other JCI countries’ website managers. The conversation we had then changed the way I thought about our new website that we developed. The lunch we had was about one hour. New learning took place and I reflected over the way we wanted to move forward with the website and all digital platforms. Someone sending you an email about how something is done. Read procedures and learn a new process. How we learn new things has an endless list of opportunities. Listen. See. Watch. Contemplate. Talk. Sleep and organise the content. How do you create an environment that will help your team and business to blossom? That’s something that all leaders are keen to discover and learn more about, isn’t it? 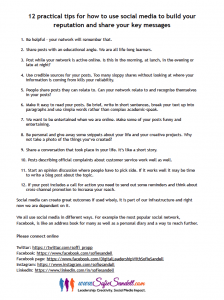 I am very interested in exploring how you can create a better work environment and in this post I will talk about emails. I get far too many emails and sometimes I spend half a day managing all of them and trying my best to action them, reply and follow up. It does take too much time. I once worked in a team that went through a big change that meant merging three teams and making lots of people redundant. One of the new people who started work in all this re-organisational mess was keen to create a ‘Code of Ethics’ so that we could all work better together. He collected some thoughts from different people in the teams and put together a document that he thought was solid and clear. He emailed everyone the document and when I received and opened it I was shocked. This is a few years back and not everyone had a smartphone as they do today. One of the points he made was that you don’t have to answer emails after 8 o’clock in the evening. I laughed at this and wondered what he was talking about. I would never answer emails that late in the evening. It turned out that the behaviour of one of the managers was not very pleasant. She expected a prompt reply and got annoyed if it you didn’t reply within 30 minutes, it didn’t matter if it was late in the evening. I believe what he wanted to say in the Code was that you aren’t expected to work late into the evening and that you should spend quality time by yourself or with your friends and your family and not spend your nights replying to emails. We all know that working late is not very healthy, if you are getting into the office feeling sluggish due to a lack of sleep then you will not be that efficient. However, there are still a number of managers and leaders who send emails late in the evening or even in the middle of the night. I was reading a blog post the other day about a professor at Harvard Business School, Lesley Perlow. She has written a book called Sleeping with your Smartphone, a very intriguing title. She studied what happened when managers had a chance to disconnect from work – no email in the evening etc. – and the result was that they felt more excited about work, they were more satisfied with their personal and professional life and they also became more collaborative. So her research shows that it helps to encourage your colleagues to shut down and not work late at home. Last summer I met up with a friend of mine who works for a large Swedish company and she was telling me about her manager. The manager had a habit of emailing her and the team at 4:30 in the morning, and this happened several days a week. When my friend came into the office she had already read all of the emails on her iPhone and knew that she had to action them ASAP. Her smartphone was no longer a tool that made work easier, no, it was a tool that she now connected with a feeling of fear. Has this happened to you? Have you ever feared that you will wake up with emails in your inbox that will determine what your day is going to look like? Are you replying to emails after 10 o’clock at night? Are you sending requests to your colleagues late in the evening and expecting an answer that same evening? I believe that email is one of the most misused digital tools. Some people don’t have any idea about how to use it effectively. If you are a corporation or a large organisation you are likely to have goals that you want to achieve and stakeholders and shareholders who expect you to achieve these goals. If you have a culture that is making people feel stressed and is preventing them from having a good work-life balance, it is unlikely that they are delivering their best. You will only be tapping into part of their potential. Managing a team includes making them enthusiastic and helping them to understand that you are all working towards the same goal. If you are better at communicating your goal and where you are going as a team you are likely to send fewer emails. People will already know what they should be doing. My friend with the crazy manager with bad email habits didn’t have the guts to tell her boss that this behaviour is not good for her, so the problem continued. It’s not healthy for anyone to develop bad email habits. I think that leaders and managers have the responsibility to lead and not to stress people out. How you communicate and which tools you use to share your message is incredibly important, but still so many people are using emails to send out orders. Just because you have a thought late in the evening doesn’t mean that you have the right to interrupt another person’s life. You might be “kind” and tell them that you don’t expect a reply late at night, but people are curious and will check messages on their smartphones in the evening. The email you sent may have been communicated in a better way, say in a team-meeting or over the phone. Expecting people to reply to emails late at night or very early in the morning doesn’t actually help an organisation to reach its goals. It’s not in anyone’s true interest to deprive people of a work-life balance. To create an environment that will support and help employees to connect with each other and reach further you must know what kind of behaviour is going to make this happen. Emailing late in the evening and replying to emails on your smartphone just before you go to bed will not create this environment. It will create stressed out people who are not able to preform at their best. Use digital tools in a smart way, not as tools that create fear. At the pen this morning is me, Sofie Sandell, sharing my digital wisdom with the world. My challenge this month is to reduce the time I spend emailing by 50 percent. So, if you don’t get a reply from me, please don’t send another email, give me a call instead. If I am free I will pick up the phone. The more I learn about leadership and creativity, the more I realise that we must learn about ourselves and what drives us in order to be effective leaders. Leaders that create great change do so because they believe in something and care deeply. They are able to drive change and to train the people around them to understand what’s possible to do – and they can even lead others to share their beliefs and enthusiasm. It’s not easy being a leader and I think it’s especially hard for women to be leaders. But this article will not be about female or male leaders. Here we are going to focus on what drives us and where that drive comes from. A while ago I was interviewed by the Web Managers Group blog and I said that the less you lead without your ego the better. When I said ego, what I had in mind were the people you meet who can never be wrong … it’s as if they have a stubborn shell around their whole body and personality. They can’t listen to anyone. Working with someone like this is frustrating. Do you recognise my description of this type of person? I believe we all meet people like this every now and then. To let my friends know that I had been interviewed in the blog I put an update on my Facebook page that mentioned egos and leadership and that your ego is the invisible cord that keeps you away from what is possible. This led to a very interesting discussion, and two professional speakers on leadership, Paul Bridle and Graham Wilson, and some other friends gave their input. I said in my Facebook update that if you are more open to suggestions and ideas you will have more fun at work. If you look at modern organisations, many people start working for a company because they like the brand. They like the sensation they feel when thinking about the brand. A while ago I read in an HR magazine that 70% of all young professionals leave the organisation they work for because of bad leadership. I believe that bad leadership and big egos are connected. I also think that if you are stubborn in a way that prevents the birth of new ideas you will not be a very nice person to work with. Most of us like to work with people who make us feel part of a group. If your colleagues never listen to you then you are not going to be a happy bunny. A few years ago I produced a series of online videos and the director I worked with said something that’s stuck in my mind ever since, she said that we want to work with people who are nice, that give us energy and that are happy to share their thoughts and ideas with us. And, if we are able to do these things this means that we are not driven by our egos, but that instead we are driven by collaboration and the ability to think in partnership with others. As a film director and producer, my friend is always working with talented people who are dependent on each other. These people would not be able to create any of the TV programmes or documentaries they do if they were not good at working together. They’re highly dependent on each other’s skills, knowledge, experience and desire to create something amazing that will inspire people. So, why am I connecting a Facebook post to a film director? Because I think we can learn a lot from the film director’s collaborative working methods. I think that we’re getting pickier and pickier about who we work with, why we’re doing what we’re doing and where we’re doing what we’re doing. If you are not able to tune into other people’s true talents and skills this will not benefit your business’s development. My friend the film director is great at managing other people’s talent. She communicates why she is doing what she’s doing all the time. She recognises that she would never be able to do this by herself. I especially remember when we were filming together near the Southbank Centre in London and how we worked as a team to complete different tasks in a very chaotic environment. What we did was to listen to each other, show appreciation and ask for tips and advice on how to do things better. I remember noticing that everyone around me had very high expectations. And high expectations are not to be confused with ego. I believe that the future will be more collaborative and will be more about partnerships. If you want collaboration to work for you, you need to delve deep within yourself and see what is driving you to do what you do. Think about how you share your thoughts and ideas with the people you meet in your network online or offline. Be better at showing appreciation and people will work harder. By the pen is Sofie Sandell, if this was the first time you read my blog, welcome here. I share my thoughts about leadership, creativity and social media. I believe that we should use the digital tools smarter to reach further and higher. Here are 20 tips for how to become a better leader who is focused on the future and their customers’ needs. You can download the tips as a PFD here. Focus on the future – there is too much focus on the present. Take time to reflect about your customers and what they will want from you in the future. Get to know your brand’s values, discuss these with your colleagues, and remember them when communicating online (and elsewhere). Be a fan of other brands and learn what engages you – this will help you understand your fans. Get to know your fans and understand who will promote your brand among their peers. If you set up groups or forums online learn how to be an awesome facilitator. Participate in groups online – LinkedIn/Facebook/Forums – it does help to have a network to collaborate with. Become a guest blogger, if you like writing. This helps you share your thoughts with a wider audience. Measure only relevant data. If you have too many numbers to interpret every week you will have an exploding wardrobe but still won’t be able to find anything to wear. It’s all in the details – pay attention to the small changes in your audience’s behaviour. Test. Test. Test. It’s never a flawless process working on digital development. It’s a bumpy ride! Learn more about how creativity works. This will make you a better leader. When a mistake is made, move on quickly, don’t remind people about it. That creates risk-adverse teams. Set up processes that work easily so that people can continue to use them without your input. All processes must be easy to understand. The success of a project can be measured by how well the people who took over after you are doing – don’t make anyone dependent on YOU. 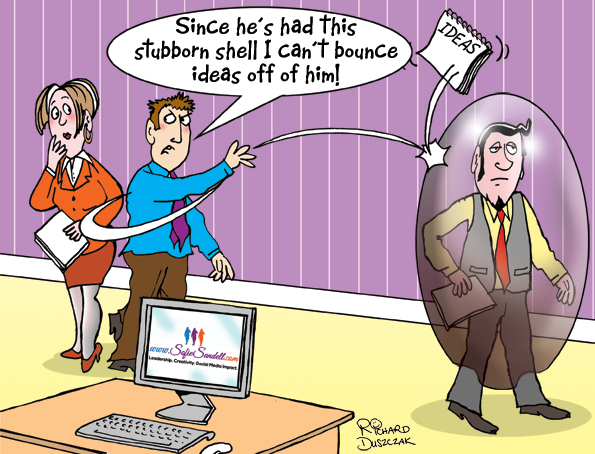 Ideas are likely to come from within your organisation or from your close stakeholders. Be open to new ideas and make it a habit to listen to everyone. What are your competitors doing in the digital world? Make sure you are ahead of them. Digital leaders do things first, not second or third. Get a sustainable structure in place, and have a strategy that looks far ahead – a minimum of 12 months into the future. 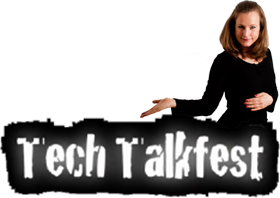 Learn new techie things! You need these skills to make better decisions. And when you explore new technologies you create new patterns in your brain and this keeps you young and alert. Here is an interview with me from the Web Managers Group blog. I thought I should share it here with you as as well. Reading the book, it was refreshing to discover your emphasis on the digital leader’s responsibility for establishing the conditions for creativity and innovation to flourish. What made you decide to write it, and to give it this focus? I’ve worked on digital marketing and e-commerce in large organisations in the past and I learned that you have to be innovative, brave and daring enough to take risks when you introduce new digital ideas. Many people fear new technology and that can stop development and bring an entire organisation to a standstill. I’ve been interested in leadership and creativity for years. I started writing about these topics in a blog four years ago, mainly to demonstrate credibility when I was pitching a new TV programme to the BBC and Channel 4 in the UK. I wrote about the leadership challenge and how to manage creativity, and I also shared some of my own experiences of working on digital projects. Consumers are becoming increasingly demanding (maybe you’ve noticed that yourself!) and to keep your clients happy you need to explore new techniques and new ways to connect. When you discover new ways to do business you will most likely use digital tools, for example, to establish new ways of trading, new ways of managing customer service and even in the creation of new products. Businesses that do well even in a recession are often ahead of the game, use technology well and show the way forward for others. These businesses are not waiting on anyone else or to learn from, they don’t want to copy ‘best practice’ before they take action. They make mistakes, learn from them and then move on to the next project. At the start of the book you talk about digital leaders as catalysts for unlocking and fostering creativity by taking new routes. You stress that this means breaking from old patterns and routines, and allowing for mistakes and improvisation along the way. Why does creativity thrive best under these conditions? 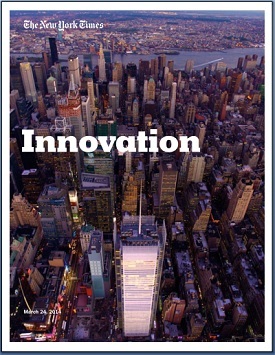 An organisation that manages innovation well also knows how creativity works. I believe that we lose a lot of our natural creativity during our school years. After being told to do things in a certain way in school we don’t dare to explore things anymore. We try our best to fit in and to not stick out. When you break a pattern or try out something new you stick out, and you might find yourself in an uncomfortable situation. If your team and environment supports you, you are more likely to be successful, but if they make fun of you and turn you down you might stop trying. The ability to be creative is dependent on good communication with your team and shared values and beliefs that will drive you forward, as well as leadership that will quickly forgive you if you mess things up. I interviewed a Swedish creativity expert named PA Ståhlberg and he said: “If you want real creativity, you have to goof!” You might be uncomfortable making mistakes, but his recipe for success calls for at least three mistakes per month. You can read my interview with PA Ståhlberg here. You highlight the reality that team creativity can be tricky, but acknowledge this is the type of creative context most people work within. What’s the core tactic by which we can learn how to improve ourselves and foster team creativity within the parameters of the system(s) surrounding us? I believe it starts within us. Discover what makes you creative and what stops you from being creative. If you feel that you are not very good at being creative I have good news for you. You can learn how creativity works. When you work in a team one thing that really matters in regards to how creative you feel and dare to be is language. When someone is suggesting an improvement or a new idea, take the time and listen to what your colleague has to say and encourage them to tell you more. Sometimes we are so busy that the way we communicate with others stops all kinds of flow and creativity and we won’t even spend two minutes listening to our colleagues. If this happens often you will soon see the results: bureaucratic inertia. Equally, we often evaluate an idea when the idea is too small and weak to survive criticism. I’ve made this mistake many times and presented a new idea to the kind of people who think that gold medals are awarded for being the most critical person in a business. When you have a new idea or project you need to give it time to grow stronger and you need to share it with people who will give good input. Then, when it’s well-equipped for scrutiny, you can share it with the people who don’t know how to nurture ideas. I believe that all organisations and people benefit from collaboration, internally and externally. One way of helping creativity to flow is to form great relationships with the people around you. Then when you have a challenge you have more people to ask for help and they will be likely to help you out. How can a digital leader or manager dispense with the “objectivity space” (my term) or neutral perspective consultants can provide? If doubt persists among more senior staff about internally generated solutions, isn’t inviting in consultants sometimes the way out of Catch 22 situations? Yes, it can work to bring in someone from the outside to point out what should be done and it may well be necessary to do that in an organisation under certain circumstances. If something is totally messed up and there is no trust in the leadership this might be the only way forward. Also, if there is a lack of knowledge in a particular area, organisations may wish to use external resources. In organisations with weak leadership I’ve seen situations where businesses choose to listen to an outsider just because they never listen to each other. This is a structural leadership problem that can be solved by better communication. If people are afraid of sharing their ideas or never suggest anything because, for example, they find that their manager is always too busy to listen to them, then most people will avoid speaking up. This is, of course, not ideal and the change has to come from the leaders and the managers. It might also be an awareness problem – that is, the leadership have forgotten how to listen. It’s clear from the book that Pixar Studios is a creative ecosystem you’re inspired by: a place where creativity is practiced as being about solving problems along the way and where all the concepts are conceived and developed in-house. What key management and cultural factors at play in Pixar enable this? Pixar have a strong belief that every individual’s contribution is valuable. Computer animation is complex and every opportunity to make a process easier saves a lot of time and resources and for that reason they encourage everyone to share new ideas and better practices. I often see in my creativity workshops that when people feel that their view matters they will share their more inspired ideas. When they feel that their voice doesn’t count they will remain silent. I also know people who have worked with Pixar and they were impressed by the way the company managed knowledge between people and projects. When you share knowledge and keep an environment open for new ideas people become more creative. On Pixar’s website you will find ”Life at Pixar” defined as: ”Unique ideas. Compelling stories. Visual artistry. Cutting-edge technology.” These phrases are a great expression of what the company believes in. To be able to create unique ideas and compelling stories you have to fight complacency. The day you are “happy” and there are no more improvements to be made is the day you move backwards one step at a time. I also believe that Pixar’s partnership with Disney has been a key driver of their success. When organisations work together magic can happen, in this case movies such as ‘Toy Story’ and ‘Finding Nemo’. Tell us a few of the steps they take to ensure this which could usefully translate to other organisations. Pixar trust that a solution to complex problems exists. Team members also believe that they can figure this solution out if they are stuck with a problem. Often when you are totally stuck with a technical problem the best you can do is to move away from the problem for a while, go for walk or leave it overnight, and then your brain will work on it and make some new connections when you are thinking of something else. The next time you look at the problem you see the solution. When we relax we create new patterns in our brain and that helps us to think more creatively. This works for all kind of problems, in all kinds of organisations and all over the world. The other day I heard that Einstein often spent time relaxing in his rocking-chair. When sitting there almost falling asleep he came up with many of his ideas. To relax and daydream works wonders for your creativity. At Pixar they are always learning and improving their knowledge at all levels: at an individual level, team level and organisational level. They know that you can learn from every person in an organisation and an experienced team member can learn from a newer member of the team. Remove the hierarchy and you get better knowledge management. Organisations such as Pixar use feedback in a smart way. They train their employees to give feedback often and in a friendly manner so that people will get used to it and won’t get upset when someone suggests that they do something differently. One technique they use is to get employees to show what they have been working on every day using a central computer system. This way no one hides work from team members. The next morning all teams gather for a short run-through of the project with the supervising animator and the film’s director. When feedback is received daily it becomes less threatening. Another technique they use is feedback meetings. The idea here is to challenge work and make it better. These meetings are short and intense and people give detailed feedback. This can be a high pressure environment but everyone knows the purpose of these meetings and wants to know how they can improve their work. The core transferable lesson here is the less you lead with your ego the better. Ego is also known as pride, vanity or “the stubborn shell” you sometimes protect yourself with. Your ego is the invisible chain that keeps you away from what’s possible. Be more open to suggestions and ideas and you will also have more fun when you work.